This spring, students enrolled in the Albany, California, School District sent a racist instagram message. The message reportedly depicted African American classmates and the girl's basketball coach with nooses around their necks. The district took disciplinary action against the students, but also some students who had "liked" the message. Four of the students who liked the message filed a federal lawsuit, alleging that their behavior occurred off-campus and is protected by the First Amendment. The federal judge has now temporarily blocked the suspension of these students. It is just a few pages in the Trump Administration’s budget proposal, but to student borrowers and indebted graduates toiling in public interest jobs that they entered because they expected to have their loans forgiven, they are pages that matter. The Administration wants to eliminate the Public Service Loan Forgiveness program (“PSLF”), which “unfairly favors some career choices over others and is complicated for borrowers to navigate,” in its entirety. The full proposal is here and the quoted language comes from page 129. This is not the first blow student borrowers expecting to count on PSLF have suffered – see this prior post – but way back last month, the Administration had not proposed complete shutdown. The White House proposes elimination of multiple student loan repayment plans in favor of a single, income-linked plan under which borrowers would pay 12.5 percent of their discretionary income. (This is from page 127.) Any undergraduate debt remaining after 15 years of repayment would be forgiven; graduate debt, after 30 years. I confess I did not reach out to Cass Sunstein for comment on the lessons of behavioral economics, although I would be curious what his thoughts are. It does seem plausible to claim that few students consider monthly interest payments on their loans when making enrollment decisions. On the other hand, any federal subsidy that reduces overall indebtedness and so lowers the financial burden of higher education is a concrete, good thing. What makes these changes so interesting is the way they muddle the purposes of federal student aid program. I should say, muddle further, because since the G.I. Bill, the federal role in higher education finance has pursued multiple goals. Some government programs aim to encourage students to pursue higher education who otherwise might not; some seek to encourage students to make career choices that serve the national community; and some states seek to reward students who have done well in primary and secondary school and might well have enrolled in college anyway. The antipathy to PSLF is telling. That program did not seek to confer an “unfair” advantage on those graduates who launched themselves on some random career path but to create an incentive for students to make choices beneficial to all of us, choices that otherwise would not be feasible. Apparently in the view of the Trump Administration, choosing to pursue public service and accept low pay is no different, from a policy perspective, from choosing to pursue a lucrative private sector career. And that indifference to any distinction between public service and private wealth accumulation may be a hallmark of this Administration’s approach to education policy. This study examined the prevalence rates of 13 bullying-related indicators in a population-based sample over 10 years. Survey data from nearly one-quarter of a million students indicated that bullying has remained a prevalent, although declining, experience for school-aged youth. Specifically, 13.4% to 28.8% of students reported experiencing bullying in the past month, and approximately half of the students reported witnessing bullying. These estimates are consistent with recent bullying-prevalence reports, and they add to the current literature with the inclusion of a younger sample of youth. Despite these fairly high prevalence rates, the covariate-adjusted results for 10 of the 13 indicators suggested things may be getting better, as indicated by a reduction in bullying prevalence and related attitudes. The effect sizes of the change were in the small-to-moderate range (ranged 0.04–0.67) when comparing the first and last years’ data. Some forms of victimization were commonly and consistently experienced across years (eg, relational). The prevalence of cyberbullying was consistently <10% and is comparable to the National Center for Education Statistics and the Bureau of Justice Statistics data. Based on previous research, it was hypothesized that cyberbullying might increase, but consistent with the other forms of bullying, cyberbullying also decreased. However, given the rapid change of technology and new social media platforms used by youth and increasingly at younger ages, the nature and quality of cyberbullying may change; therefore, future studies should examine cyberbullying in greater detail (eg, broader definitions). Physical, verbal, and relational bullying experiences dropped ∼2% each year to below 10% in the most recent year. Rates of perpetration reduced by 1% to 2% per year and dropped below 10% in recent years. Furthermore, witnessing bullying also decreased significantly across the decade. Approximately 80% of students reported feeling safe and like they belong at school across the decade. Interestingly, ratings of safety, but not belonging, improved significantly over time. There were clear differences regarding bullying and climate across school levels. For example, high schools showed the most improvement across time; although this is promising, bullying peaks during middle school, so additional supports may be necessary during these school years. Although the yearly changes for all of the outcomes were small, some of these changes were fairly substantial across 10 years, as indicated by the effect size estimates comparing the first and last years (average d = 0.325). Notably, the most recent years evinced the greatest improvements in school climate and reductions in bullying. This could be due to the increase in bullying policies over the past decade as well as the simultaneous increase in effective evidence-based programming aimed at reducing school-based bullying. These factors could be associated with further decreases in bullying in years to come, so it will be important to continue to surveil these indicators over time. The significant associations between school-level covariates and the change in bullying indicators were limited and not consistent across outcomes. Given the small magnitude of the covariate estimates and the large number of outcomes examined, readers should be cautious in the interpretation of the trends regarding school-level covariates. Although this study possesses strengths such as the population-level sampling, the large sample size, the broad age range surveyed, and the longitudinal nature of the data, some limitations should be noted. For example, student data across years were not linked, given the anonymous nature of the survey, which limited the analyses that could be conducted. The anonymity was, however, an essential part of maximizing response rates and may have contributed to students being more candid in their responses; given the sensitive nature of the data collected, anonymity decreases the chances of response bias related to social desirability, which could otherwise be a threat to validity. Although the data collection and sampling procedures were consistent across the 10 waves of data collection, the district leadership has placed greater emphasis on the collection of data in recent years; this may have contributed to a slight uptick in the number of students participating in the survey in the last year of the data collection. However, the weighting procedure allows for generalizability of the sample to the full population of students within these schools. The use of sampling weights was a strength of this study, although we were somewhat limited in the number of variables we had to use as weights; therefore, we relied largely on basic demographic information that was available at both the student and school levels. This is a common approach in large-scale survey research. Although this study addresses the prevalence of bullying-related indicators over a decade, it does not shed light on what accounts for these changes. Information related to particular school efforts, programs, or initiatives to which reductions in bullying or related attitudes could be attributed was not assessed and, therefore, could not be examined. Future research is needed to systematically examine the implementation of antibullying programs and policies and the impact of these efforts. It is the “sticker price” of a college education, or the publicly reported tuition and fees and, sometimes, room and board, that typically gets all the press attention. Yet as with so many other products, the asking price is just the start of a negotiation, and the latest report from the National Association of College and University Business Officers (NACUBO) reminds us that education is no different, at least in this respect. Of every dollar in gross tuition revenue from first-year students, colleges and universities used nearly half for grant-based financial aid, according to the summary of NACUBO’s annual Tuition Discounting Study. The institutional “discount rate,” 49 percent, is the highest the organization has ever reported. The summary of the report by NACUBO, whose members are college and university administrative and financial officers, is available here; the full report costs money. The findings are based on a survey of 411 private, nonprofit institutions. The summary identified two other, potentially worrisome trends from the survey. First, surveyed institutions reported a decline in the rate of growth in net tuition revenue, to 0.4 percent. Second, nearly 40 percent of surveyed institutions reported that the number of students they enrolled had declined, both for their first-year classes and their total student body. If fewer students are enrolling and limits to the ability of institutions to pass on costs to students are becoming apparent, all but the wealthiest colleges and universities may face some difficult choices in the years ahead. Private, nonprofit institutions face a powerful incentive to keep raising the sticker price, in an effort to procure revenue from that shrinking sliver of the college-going population that is able to pay, even as they must offer ever more financial aid to everyone else. Or, if they reduce aid, they will push private higher education further out of reach of a growing number of potential students. This is another insidious manifestation of inequality. U.S. public schools now have a majority students of color yet are increasingly segregated by race and class—as are many of the communities around the country. School integration is an important evidence-based strategy that can improve academic and social outcomes for students from all racial and economic backgrounds. In this new era, however, it can be difficult to know what type of diversity policies are both effective and permissible. Learning about other resources that can assist with integration efforts. To register for this event, complete our registration form by Monday, May 22nd and indicate which breakout session you plan to attend. Breakout session topics are tentative and may be changed to reflect interests of participants. Please contact Erica Frankenberg at euf10@psu.edu if there’s a topic you are interested in. The full agenda follows the break. One of the critical steps taken in recent years to help student borrowers manage rising levels of indebtedness was the creation of flexible repayment plans, which tie monthly payments to borrower income. However, most students do not use these plans and many may not even know they have the option. Yesterday the Consumer Financial Protection Bureau provided some evidence of the cost of ignorance, for borrowers who are most at risk. The Bureau released a brief report finding that more than 90 percent of borrowers who already defaulted on student loans were not enrolled in one of these flexible repayment plans. Further, the Bureau found, these borrowers who did not enroll in one of the income-linked plans were five times as likely to default a second time. These findings, based on responses from student loan services that, together, manage accounts for approximately half of all student loan borrowers, suggests that students are not getting the word. Overall, rates of delinquency – that is, falling behind on payments, a prelude to default – are lower for students on income-linked plans. Slightly less than one-third of federal direct student loans in repayment are in an income-linked repayment plan, according to the Education Department’s Office of Federal Student Aid. The findings should raise three questions. First, how well are student loan servicers advising borrowers about their repayment options? Second, why are there so many plans, creating such complexity for student borrows to navigate? And third, why aren’t income-linked plans, rather than the ten-year, fixed payment plan, the default for all borrowers? Good questions all. Unfortunately, the answers are not in the Bureau’s report. But the implication is clear: In the absence of regulatory action, students need to be better informed about their options. The federal Education Department’s description of the different income-linked plans is here. This post will not try to weigh the relative advantages and disadvantages of each. Others, including The New York Times, Time and US News, have already taken that on, and The Institute for College Access and Success has put together a handy comparison chat. Below are two competing views of the relevance on racial disparities on the bar exam and what we should, or should not, do about them. I want to thank both authors. Dan Subotnik asked if he could start the discussion on this blog. While he offers a biting critique, he was gracious enough to allow Deborah Jones Merritt the opportunity to review his essay in advance so that she might respond. Deborah Jones Merritt was quick to offer a response in the middle of graduation and grading. They offered this blog a unique opportunity to host a high level debate. Owing minority groups little for their support in the election, Donald Trump is not likely to go out of his way for them. It is not surprising, then, that others are taking the lead. This flawed exam puts clients at risk [and] subjects applicants to an expensive, stressful process. . . The mismatch between the exam and practice, finally, raises troubling questions about the exam’s disproportionate racial impact. How can we defend a racial disparity if our exam does not properly track the knowledge, skills, and judgment that new lawyers use in practice? For purposes here, I will concede the validity argument. Further, I will admit that the skills at issue can be tested in some reasonable manner. The question I raise has to do with race, Without explicitly holding that bar results would be different, Merritt is quick to use racial disparities to help justify a “new” bar exam. But does this make sense? If not, what are the implications? Consider: if (a) law schools provided solid grounding in research and interview skills and (b) a bar exam was built thereon, and (c) the bar examiners applied the same pass rate, on what basis could we imagine a different demographic outcome? Do different groups have different intuitions in these areas? Whether the exam is valid or not, it has to be that differences in preparation for exams are what create differences in results. It seems fair to conclude, then, that race is being used as a hook to snare support for Merritt’s proposal. It could conceivably, beyond a hook, be a ploy and part of a larger problem. Black writers in books such as Stanley Crouch, the “All-American Skin Game, or Decoy of Race” and Richard Thomson Ford’s “The Race Card,” have themselves complained of the speciousness of race talk by black authors. White authors, according to Orlando Patterson, earn no higher marks for honest talk. Can it be surprising under the circumstances that a strong backlash could take place? And is the best illustration not the election of Donald Trump? Validity is a scientific concept, not a political one. Everyone, whatever their political leanings, should favor a valid bar exam. The current exam does not embody a coherent concept of “minimum competence to practice law.” As a result, it licenses incompetent practitioners—while perhaps also excluding competent ones. As part of my clinical teaching, I regularly encounter licensed lawyers. Sometimes those lawyers represent opponents; other times, we observe their work while we are waiting in court. Most of those licensed lawyers are excellent professionals, but some are not. The ones who fall short usually know the law and they almost always know how to argue. But they don’t know how to identify their client’s goals, gather persuasive facts, and negotiate (which is quite different from arguing). Their failures harm clients. In the misdemeanor court, where we work, poor representation means extra days in jail, higher fines, lost employment, and impaired family relationships. I agree with Professor Subotnik that preparation is the key to professional competence. If our profession develops a realistic definition of lawyering competence, and devises a licensing process to test for that competence, law schools will prepare their graduates for both the test and practice. That will be an important victory for clients. What does race have to do with it? As I explain in my original essay, we know that the current bar exam has a disproportionate racial impact. An invalid licensing test is bad: it wastes time and fails to protect consumers. But an invalid licensing test with a disproportionate racial impact is even worse: it means that the test wastes time, fails to protect consumers, and disproportionately excludes some racial groups. Three evils are worse than two. And, yes, I believe that an invalid test that disproportionately excludes disadvantaged racial groups is particularly bad. How would a new bar exam affect pass rates? I don’t know. As Professor Subotnik suggests, that would depend partly on the preparation that law schools provide. Pass rates might rise, fall, or stay about the same. Professor Subotnik, however, errs in assuming that examiners would automatically adhere to the current pass rate. If they did, that would offer strong evidence that state supreme courts are using the exam to restrain trade rather than to assess minimum competence. I assume that, if our profession adopts a new exam, we will conduct one of the recognized psychometric processes for setting an appropriate cut score. The key question, as I stress in my original essay, is not pass rates but validity. Our profession desperately needs to define the minimum competence needed to practice law, test for those competencies, and educate students to achieve them. 'Moonlight' schooled Hollywood on race. Can it take on school discipline, too? This year’s Academy Award winner for best picture tackles a difficult topic in the education world today: school discipline. In “Moonlight,” high school boys taunt the main character, Chiron, with homophobic slurs before beating him. The next day, Chiron shatters a chair across the back of the ringleader. Chiron is handcuffed and sent to an alternative school, setting him on the path toward dealing drugs. While Chiron does become the aggressor, he is ultimately the victim and suffers an utterly cruel punishment for his revenge. This dichotomy captures the major insight of my recent research on school discipline: that suspensions and expulsions frequently ignore the causes of student misbehavior. 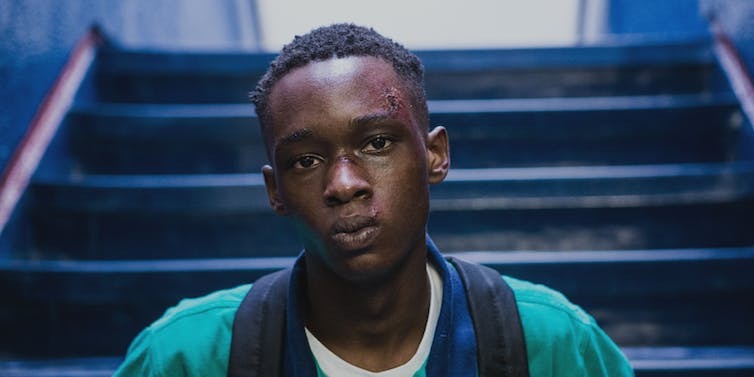 In a scene from ‘Moonlight,’ Chiron takes revenge after being bullied and beaten. Normal human development can explain a lot of misbehavior. Younger children, for instance, lack the capacity to always behave; no matter the rules, elementary school students occasionally talk out of turn, push each other and disrupt class. Older students sometimes push boundaries in other, more serious, ways. Making and learning from these mistakes is simply part of growing up. Disabilities, academic struggles, poverty, homelessness and family crises can also affect behavior. For students in these situations, misbehavior is often a sign of unmet needs – not a character flaw. “Moonlight” brings all these interconnected factors together to help the audience understand student behavior. Chiron breached an obvious boundary that cannot be condoned. Yet, his punishment seems unjust because the audience sympathizes with his struggle: His mother is a drug addict. He suffers harassment for his sexual identity. His first lover turned against him. But rather than protect him, the school leaves Chiron to deal with these challenges alone. None of this excuses Chiron’s act, but it likely deflates the audience’s urge to label Chiron as a violent student who deserves expulsion or jail. Public schools suspend or expel three million students a year – often with no attention to context. (Thirty-four to 42 percent of those students are African-American.) The vast majority of suspensions and expulsions are for behavior less serious than Chiron’s. In Connecticut, for instance, only about 10 percent of suspensions and expulsions are for weapons, violence or drug-related behavior. Most are for everyday misbehavior. Like Chiron, the data also show that a single suspension increases the chances of a cascade effect: subsequent suspension and expulsion, academic failure, dropping out and incarceration. With so much at stake, I believe schools owe students a far more thoughtful discipline system. When school discipline responds to students’ needs, it produces better behavior and academic achievement for all students – not just struggling students. Schools with the highest achievement are those that deal with misbehavior through means other than just suspension, expulsion and law enforcement. These successful schools offer counseling, academic services and other programs to help students work through their problems and to reinforce good behavior. When misbehavior inevitably occurs, it becomes a learning opportunity for students and teachers. This kind of approach, like “Moonlight,” humanizes student behavior. A school district in Alabama recently expelled "Laney" Nichols for an entire year. Her crime—having a water gun on campus. One of her male friends brought the water gun to school, but handed it off to Nichols at some point. Nichols carried it in her backpack before eventually leaving it in the backseat of her car. Apparently, another student saw the water gun and thought it was real. When the student alerted school officials, things got serious. The school initially suspended her for 10 days—arguably an overreaction itself. But the school later decided that was not enough because Nichols brought a “firearm” to school. That, the school reasoned, justified expelling her for a year. Nichols’ mother is threatening to sue. She understands the school has to take all guns seriously because you never know what might happen. But as soon as school officials touched the water gun, she says they would have known there was absolutely no threat to anyone—save a little water in the eye. Interestingly, Nichol’s first claim is gender decimation. The boy who brought the gun and another who played with it only received in-school suspension. If accurate, these allegations would raise federal anti-discrimination concerns and could be a winning argument. The school, however, will likely respond that Nichols’ behavior was more serious in some way or that their evidence regarding the boys was weaker. While those distinctions may seem minimal in the real word, they are often enough to uphold a school discipline decision. To the average observer, Nichol’s second claim— that the water gun is not a firearm under school board policy—may sound like a no-brainer. The facts seem pretty clear on this score. The question is whether it matters. The Supreme Court in Wood v. Strickland rejected two high school students’ attempt to attack their expulsion on technical grounds. The students had spiked the punch at an after-school event, but argued that the alcohol content was so dilute in the punch that it did not qualify as an alcoholic beverage under state law. They were probably right. None of the parents even noticed the alcohol. The Court, however, was quick to dismiss the case, reasoning that schools have wide discretion in interpreting and applying their own rules. Schools, unlike law enforcement, do not have to spell out every little detail in their rules or follow them precisely. For that matter, they may not even need rules. Schools have discretion to discipline students based on their judgment. Some state law could prove more helpful to Nichols, but all of these arguments miss the fundamental problem of school discipline in the age of zero tolerance. For nearly three decades, schools, lawyers, and communities have gotten caught up in questions of what the rules say and whether a student broke them. Anyone who has kids or works in school can tell you that rule-breaking is part of everyday life. Students are in the process of maturing, which includes testing boundaries, forgetting boundaries, getting caught up in the moment, or just not thinking at all. If we tossed kids out every time them broke a rule, we would not have any kids left to teach. So forget the facts and rules for a moment. The question is not whether Nichols brought a water gun to school or some other students played with it. Those sets of facts will repeat themselves over and over again, so long as kids are kids. The important question is how adults respond. Zero tolerance and other harsh discipline polices absolve adults from seriously thinking about how they should respond. As a result, those policies get that question of how to discipline a student wrong more often than they get it right. As I examine in Ending Zero Tolerance: The Crisis of Absolute School Discipline, determining the appropriate punishment requires adults to think about more than whether the student broke a rule. It requires them to think about the student’s age, motivation, personal circumstances, just how serious the behavior actually was, and the range of options that they have for dealing with the behavior. Coming down hard on students like Nichols is about little more than sending a message to students. The trouble is that the message does not deal with Nichols, or any other students, in a way that actually improves behavior or safety. When zero tolerance policies were first taking hold, a Tennessee school district expelled a student for having a knife in his car. The knife was not his and he did not know it was there. When sued, the school conceded both facts, but said it had to “draw a line in the sand” when it came to weapons. The court responded that it was irrational to punish students for accidentally violating school rules because it did not make anyone safer. Removing suspension and expulsion from the range of options for students like Nichols does not mean schools cannot punish misbehavior. It does not mean that the school is condoning weapons or encouraging more. And suspending and expelling students like Nichols will not stop others from engaging in the adolescent behavior that is part and parcel of growing up. All it will do is punish students for the sake of punishment. When schools lose sight of these distinctions, they fall into reactionary traps. They stop thinking about how to actually improve student behavior. When they do that, they undermine everyone’s education and safety, not just the suspended and expelled students. Three years ago, the municipal water system in Flint, Michigan, began delivering leaded water to homes, schools, and daycare centers. Lead is a neurotoxin that leaves irreversible effects on children's brains. Lead exposure has put every one of Flint’s 30,000 children at risk of cognitive, emotional and behavior problems. Some will experience reduced IQ's. Others will have trouble learning to read, controlling their behaviors, and focusing, among other issues. For many, education holds the only promise of a full or partial antidote. The schools in Flint and the state of Michigan have been sued for failing to provide special education evaluations and services to Flint’s children. The premise of the lawsuit is that general education in its usual form isn't going to help many of Flint's kids. Only special education will do. As a practical matter, however, special education isn't going to help many of Flint’s kids either. Special education is an individualized process requiring an evaluation of each student and the development and delivery of a plan to deliver adequate education to that student. In the average school system, fewer than 20% of students get special education. In Flint, 100% of the students could need special education. Evaluating 30,000 students and planning for all who need special education cannot happen quickly or easily. In the meantime, far too many kids will be left illiterate and hopeless. Far too many will drop out or get pushed out. Special education may fail many of Flint’s children for another reason. In general, the special education system delivers its greatest benefits to kids who attend highly-resourced schools and whose parents enjoy access to time and money. Flint and Flint’s parents fit neither category. Flint is not a high-income place. Flint’s parents, who had enough challenges before, now face new illnesses and logistical problems created by leaded water. If the students and families cannot rely on special education to do enough, general education needs to change so it can do more. Encouraging studies demonstrate that the goal is not far-fetched. General education can and, in some situations, already does reach kids who would otherwise rely on special education. Figuring out how to change general education to serve lead-poisoned students is not simple. Research is needed into possible changes and the impact of those changes on students. Teachers and administrators will need to master new protocols and curricula. Unhappily for Flint’s families, 100% of their children are possible subjects. A positive side also exists, however. Whatever is learned in Flint can be used to help the thousands of lead-poisoned children in school systems across the United States, whether those students are in general education or special education classrooms. According to a special report from the Centers for Disease Control, a few things are already known about reaching lead-poisoned children outside of special education. For example, intensive early education has been found to help young students avoid some of the worse effects of elevated lead levels. The evidence is strong enough that special funding was made available to provide intensive early education to about half the preschool students in Flint. The same report suggests interventions that hold promise for older children. Many lead-poisoned students have problems with self-management, memory and planning, similar to what is seen in students with ADHD. Educational researchers have found that written assignments and posting assignments to school websites help students with ADHD in general education classroom. See Czapanskiy, Kids and Rules: Challenging Individualization in Special Education. Perhaps lead-poisoned students would be helped as well. Students old enough to learn to read could benefit from systems like Response to Intervention (RTI), which involves frequent testing accompanied by tailored interventions. Conflict-resolution training could help students who cannot readily control explosive behaviors. Even with a responsive general education system, some students will need special education. That number may be fewer, however, so identifying and planning for them can proceed more expeditiously. Three years have already passed since leaded water reached the taps of houses, schools and daycare centers in Flint. Other cities with aging infrastructures and older housing stock face similar risks and similar experiences. Preventing exposure to lead is the only way to protect children. When that doesn’t happen, however, making sure that public education responds to the needs of poisoned kids is essential to their futures. Changing and studying general education could convert the tragedy of Flint from being a total loss into an opportunity for a better future for lead-exposed children everywhere. Law can push the process by insisting that all children get what they need, whether in general education or special education settings. Lawsuits cannot do the job alone. Educators, school administrators, communities, public officials and funding sources need to come to the aid of Flint’s children and lead-poisoned children everywhere. In this article, Babette Boliek proposes privacy law changes to encourage data collection entities "to either decrease collection of sensitive data or increase investment in privacy protections." As an example of the type of privacy issues that lax rules can create, the article uses the ongoing litigation of Morgan Hill Concerned Parents Assn v. California Department of Education, "where the otherwise FERPA-protected school records of an estimated ten million students were ordered to be disclosed—including addresses, social security numbers, birthdates, disciplinary records and test scores." The article is available on SSRN here. Wendy Leo Moore and Joyce M. Bell examine recent racial incidents on college campuses "within a broader context of race and institutions, suggesting a connection between overt racist expressions and the more covert elements of neoliberal color‐blind racism." The abstract on SSRN is here. Kevin Golembiewski has posted a forthcoming article that encourages courts to recognize that the Equal Educational Opportunities Act (EEOA) "permits awards of compensatory education—a powerful tool for remedying deficits that develop when a student’s educational rights are infringed." The article on SSRN is here. With regard to education, the Trump administration isn’t so different from its predecessors. The administration promises to improve schools through innovative reform while ignoring the basic building blocks of education: teachers and funding. The specifics are new—an emphasis on charter schools and voucher expansion—but the formula of gambling with educational opportunity is not. President Bush bet on standardized testing and accountability. President Obama pushed the Common Core and statistical teacher evaluations. Each of these reforms damaged schools in its own unique way. The No Child Left Behind Act narrowed the curriculum, incentivized test manipulation and cheating, and demanded punitive sanctions for schools. By setting goals that very few schools could meet, NCLB quickly fueled the narrative of a failing public-education system. The overall result has been to undermine support for public education itself. Education Secretary Arne Duncan, who served under President Obama, used states’ failure under NCLB as leverage to demand Common Core standards and strict teacher-evaluation systems. He assumed these measures could finally deliver on two of NCLB’s initial goals—raising academic standards and improving teacher quality—but the shift to these new measures brought chaos with little payoff for students. As soon as states began implementing the changes, teacher lawsuits, parental protests, and political resistance spread. States claimed that Duncan’s demands were a federal overreach. Teachers claimed that evaluation systems based primarily on student test scores could not reliably rate teachers or provide meaningful feedback on how to improve. Parents argued that the Common Core would dumb down academic content and require more testing. Rather than sort it out, Congress scrapped many of the models advanced under NCLB. In its place, Congress passed the Every Student Succeeds Act. The only animating theory of the act is that Congress must prohibit the federal government from demanding much of anything from states. The Trump administration’s agenda to expand charters and vouchers threatens to be just as disruptive. School choice is no more a panacea to educational inequities than is standardized testing. 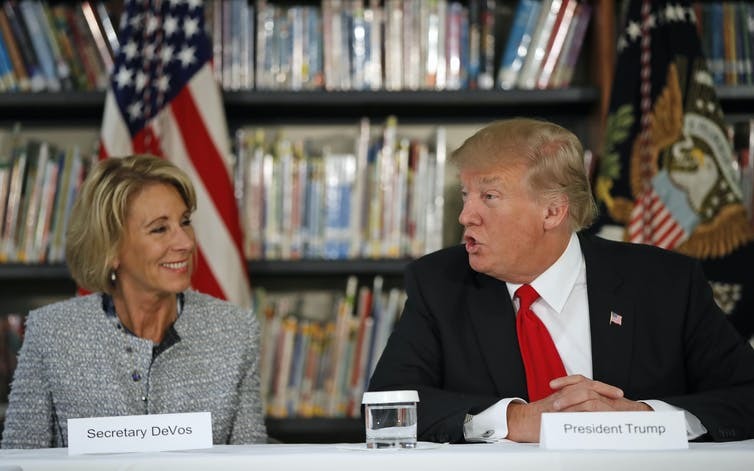 While Secretary Besty DeVos argues that market forces and parental choice can regulate school enrollment better than the government, school choice could prove even more dangerous than past reforms if not accompanied by common-sense limits regarding the students who are eligible to leave their current, the schools to which they can transfer, and the cost the traditional public-school system must shoulder. The last few years offer numerous examples of how unregulated choice opens the door to segregation, profiteering, incompetence, and marginal educational opportunities. Debating the merits of these federal reforms, however, distracts public attention from the simple things that research shows really matter for student outcomes: good teachers and school funding. Neither requires fancy reform. They require basic support for public schools. School-funding trends, however, are going in the opposite direction. Between 2008 and 2012, annual cuts exceeding $1,000 per-pupil were routine—the equivalent of an assistant teacher aid in every classroom or the entire science and foreign-language departments combined. In North Carolina and Florida, funding fell from over $10,000 to $7,000 per-pupil in just a few years. Some cuts may have been necessary during the recession, but the recession cannot explain why, in real dollar terms, 31 states spend less on education now than they did before the recession. The immediate results were teacher layoffs, lower salaries, and larger class sizes. The lingering effect is a dried-up pipeline of new teachers. In California, the demand for qualified teachers was 40 percent higher than the supply in the 2016-2016 school year. The state certified 15,000 teachers, but needed 6,500 more than that. The shortage was even worse in Nevada. Las Vegas alone had 2,600 vacancies to fill, but state produced less than 1,000 new teachers. As is the case elsewhere in the country, these shortages forced the states to put previously uncertified interns in the classroom on the promise that they would finish their coursework in their spare time. In other states, districts resorted to billboard advertisements just to get warm bodies in the classroom. These cuts and shortages hit low-income and minority students the hardest. Even before the recent cuts, poor and minority students were twice as likely as their peers to have an inexperienced or unqualified teacher. Now they are being asked to do more with less. In Illinois, schools serving predominantly poor student populations receive 23 percent less funding than other schools in the state. A 2015 Education Law Center analysis found that Nevada’s high-poverty school districts received only half the funding as others. Arizona combines all these problems in a way that may have just signed the death knell for its public schools. Arizona’s funding levels were already the third worst in the nation; its equity levels tied for seventh worst, and its fiscal effort second worst. Three weeks ago, the state passed legislation making every student in the state eligible for a voucher. Students can take 90 to 100 percent of the state money allotted for their local district and divert it to a voucher. With such a poorly funded public system, the legislation incentivizes wholesale abandonment of public education in some locations. It does not have to be this way. Schools can hire and retain quality teachers if states maintain fair funding for schools. Classrooms can be positive environments if teachers get the support and training they need to respond to students’ needs. But every moment the Trump administration spends on school choice is a moment it ignores these core education needs and emboldens behavior like that in Arizona and elsewhere. To be fair, the Obama administration supported charter schools. But it never pushed for vouchers or suggested public schools were the enemy of quality education. For Trump, school choice is not a measure to nudge public schools to improve. School choice is an end in itself—one worth sacrificing traditional public schools for if necessary. Trump’s proposed budget doubles down on school choice, while doing nothing for traditional public schools. It cuts funding for after-school programs, teacher recruitment, and literacy assistance for students with disabilities and limited English proficiency. The budget then repurposes those funds toward school choice. Trump’s rhetoric of education reform has found a receptive audience because America’s public schools are in so much need, not because his particular brand of reform has merit. If Congress ignores the distinction, Trump will make the biggest education gamble to date. The safer and far simpler option is to give low-income schools the additional resources they need to boost graduation rates and cut the achievement gap. This is the way to help every student succeed, leave no child behind, or achieve whatever other catchy phrase Congress might throw at schools. Anything short of that is just an empty promise that will soon enough, like past reforms, disappoint families.